New to the market, the CAE Luna Advanced infant simulator is designed to provide clinical learners with the essential skills to deliver the best care possible to neonates in crisis. Featuring advanced training options that are specific to the healthcare needs of babies up to 28 days old, CAE Luna Advanced facilitates hands-on, in-situ team training in newborn resuscitation, neonatal abstinence syndrome, mechanical ventilation support, seizures, and more. Pre-order the new CAE Luna Advanced infant simulator today and save almost $11,000 off your total purchase price and get an additional one-year value warranty. Prepare your neonatal care teams to respond appropriately and effectively to some of the most critical, unexpected, and high-risk events that may occur within the first four weeks of a newborn’s life with the industry’s most comprehensive infant patient simulator. Buy early and get a head start on improved training with CAE Luna Advanced! With CAE Lucina and CAE Luna Advanced in one cost-saving bundle, you get the best of both worlds in mother/baby simulation. Not only does this enable your labor and delivery teams to practice emergency care on a pregnant patient and gain proficiency in normal-to-rare childbirth scenarios within a risk-free environment, but your learners also acquire training necessary to develop mastery in the most crucial aspects of newborn and neonatal care. The CAE Luna baby simulator provides a unique and comprehensive range of healthcare training experiences that are unmatched in the industry, while CAE Lucina’s integrated maternal-fetal physiology and validated curriculum offers unrivaled versatility for childbirth and female patient simulations. Now, save more than $15,900 when you combine our phenomenal CAE Lucina childbirth simulator with a pre-order purchase of a brand-new CAE Luna Advanced infant simulator. ** This essential maternal/infant training bundle offer includes an Urgent Obstetric Situations Learning Module and an additional one-year value warranty on each patient simulator – all at no extra cost. * This offer excludes cost of shipping. This offer cannot be combined with any other discounts, quotes or promotions. *This offer excludes cost of shipping. This offer cannot be combined with any other discounts, quotes or promotions. ** Individual simulators will ship separately. *** Upgrade required for Mac, etc. 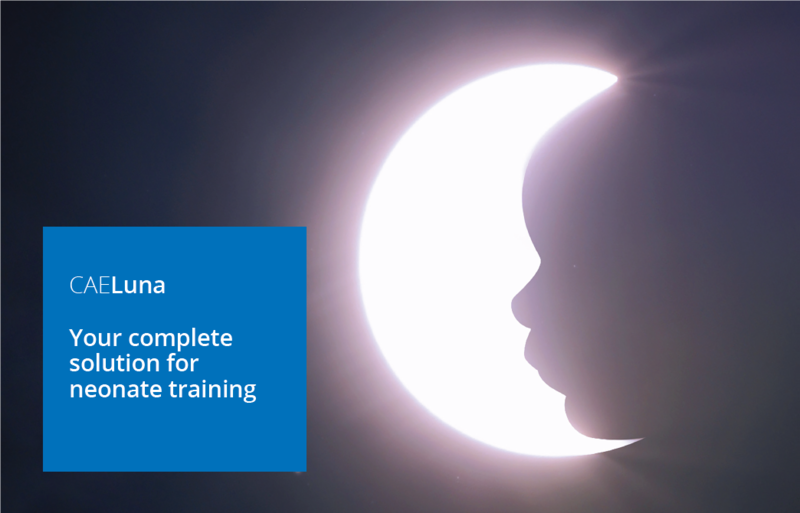 CAE Healthcare’s first tetherless and completely wireless baby simulator, CAE Luna, embodies a complete range of options for essential training in the care and medical treatment of a neonate. CAE Luna is a remarkably lightweight patient simulator that realistically represents a baby from newborn status to 28 days after delivery. CAE Luna meets critical healthcare education objectives in infant patient simulation and compliance requirements in neonatal nursing, Pediatric Advanced Life Support (PALS) and the Neonatal Resuscitation Program (NRP).